In a previous post we saw the myriad of different applications capacitive technology is involved in. 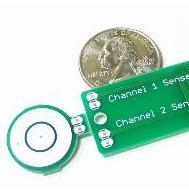 We will discuss today the underlying physical principles of these sensors. Figure 1 shows a normal plate capacitor, in which two conductive plates of equal size (A) oppose each other in distance (d). Once a voltage is applied to both plates, an electric field will exist between them. Depending on the so called dielectric in between, the electric field will hold a certain amount of electrons captured within. Capacitance refers therefore to the capacity to store and hold this electric charge. 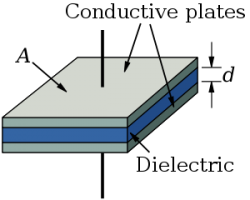 Figure 2 shows a typical electrode design of a capacitive proximity sensor. The formerly opposing plates have now circular shapes and lie within small proximity on one layer. The capacitance can be measured by determining the amount charge necessary to reverse the polarity of the conductive plates. The more energy the system needs, the higher the underlying capacitance value. The following formula reveals the relationship between the plate distance, size and dielectric material properties on the capacitance value. d is the separation between the plates, in meters. In the next part we will discuss implications of the formula and the ways capacitive sensors can detect physical changes. Next PostNext Does target size affect the sensing performance of an inductive proximity sensor?